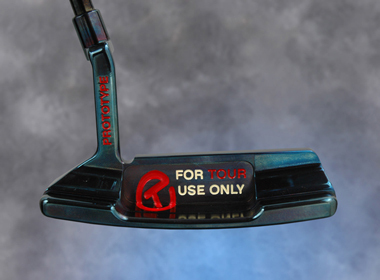 Awesome putters are created for this year’s Museum & Gallery event as Special putters. 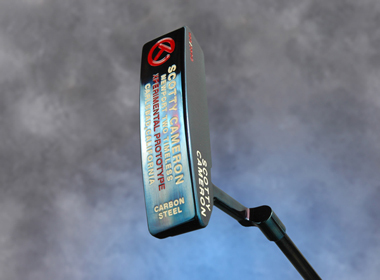 The first Carbon Steel Newport 2 Timeless in the world has a bold Industrial Circle T stamp on it. 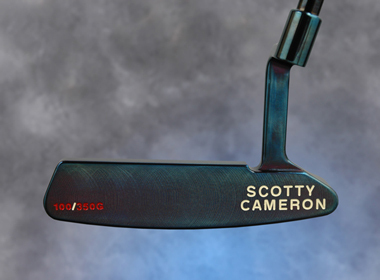 According to Scotty, this design is the first one in the world and it is limited to 100 produced for this occasion. 10 out of 100 are even more special with chromatic blue finish and a black coated shaft. 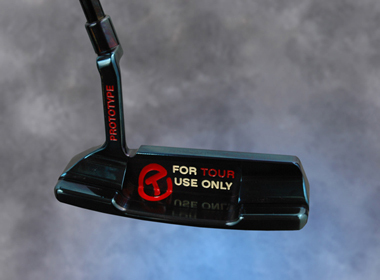 A very cool logo “For Tour Use Only” is on the back cavity! We have recently sold the last Newport 2 Classic SSS Cherry Bomb regular neck putters, now we have Newport 2 Classic SSS Cherry Bomb long neck and slant neck in stock. Both of them have Scotty’s personal stamp “Peace of Mind” to prove they are the last of the production of SSS long necks and slant necks. As we explained in the previous column, Scotty got the idea for the “Peace of mind” stamp from Japanese stamps and it has now become his personal stamp. The fact that Scotty created 3 different neck types, regular, long and mid slant of the Newport 2 Classic Cherry Bombs at the very end, we can also assume his passion in making the SSS Classic Cherry Bomb is very strong. With the long neck and slant neck versions, the Newport 2 Classic SSS Cherry Bomb has come to an end and we will not receive any more in the future. We uploaded the new slide show -the prizes for the annual meeting Part-3. the 4th Scotty Cameron Museum & Gallery meeting and golf tournament. We have uploaded the new movie on our website – the Buttonback Select with anodized aluminum insert. We received a DVD from Scotty. We have uploaded it on our website, “Movie” page. Please check it out. We uploaded the new slide show -the prizes for the annual meeting Part-2. We also received a DVD from Scotty.